Hal Stearns has short, greying hair, glasses and a military bearing. For the past four years he has taught My Love Affair with Montana, a course at the Osher Lifelong Learning Institute at the University of Montana, also known as MOLLI. On a Friday morning in January, he stands at the front of a classroom in the Todd Building, setting up an old-fashioned projector as students filter in. The classroom fills up slowly, friends and new acquaintances around the room saying hello. MOLLI caters to students 50 years old and older, and there’s a wide range of ages represented. By 9 a.m. the large classroom is full, and the chatter dies down as Stearns begins to talk. It’s a warm, friendly atmosphere. Stearns jokes with the class and spins yarns about his own experiences before launching into a history lesson about Lewis and Clark. Students in the darkened classroom are attentive, eyes on Stearns and the photos in his slideshow. He reminds the class that the Lewis and Clark Expedition succeeded because of excellent planning, good luck and a willingness to forge ahead into the unknown. When MOLLI began in 2005, it was the first UM program specifically for adult learners. 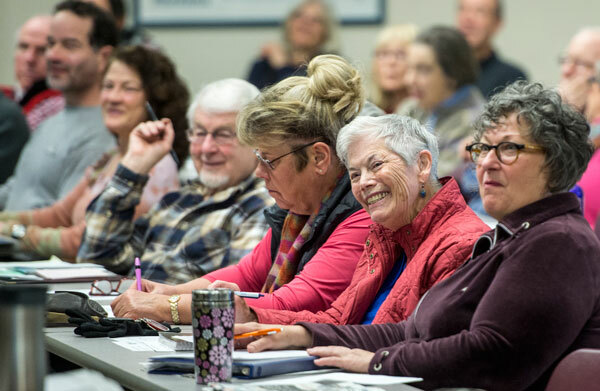 That fall UM organized two public lectures for Missoula’s older adults. They were a hit, and the program officially launched with five classes. Three years later the Bernard Osher Foundation made a game-changing gift of $1.05 million, officially establishing the program as the Osher Lifelong Learning Institute. MOLLI is one of 119 such institutes across the country. With these funds, and the encouragement of UM administration, MOLLI flourished. Each term more students enrolled in its courses, one-time lectures and other activities. They came from places as far away as Butte and Great Falls for classes on subjects like Shakespeare, volcanoes and theater production. Since then, the program has seen record growth; during fall semester 2014 MOLLI offered 23 classes for 930 participants. The Osher Foundation has been so pleased with MOLLI’s success that this winter it made a second gift — $1 million. The majority of the foundation’s gift has gone into an endowment to ensure MOLLI’s continued growth, while $50,000 will support current operations. Hal Stearns teaches his entire class — 90 minutes long — without notes. Afterward, students flock to him to ask questions, tell him about a book they’re reading or share their own stories. It’s the students that keep him coming back term after term. He believes that MOLLI is about learning to see the world differently, and he delights in offering his students a new perspective. That mantra is clear in Emily Freeman’s Introduction to Memoir Writing course as well. Near the beginning of the winter term, she opens a class by having students write about a memory of a watch or a clock. There’s a period of silence as the students write, then a few raise their hands when asked to read. For most, the exercise brings up memories they hadn’t thought about in a long time. “I like what you had in there about the ticking of the clock,” Freeman said after one reading. “We don’t hear that sound very much anymore.” She encourages her students to consider sensory details like sounds and smells when writing about their memories. Mora Skari-Payne, a UM alum and retired music teacher from Butte, has been taking MOLLI classes since the very beginning. She has even been able to share what she’s learned with her granddaughters, an opportunity that brings her great joy. And like Stearns, she appreciates the way that MOLLI classes open her up to new ideas, even in her advanced years. Like everyone deeply involved with MOLLI, Hal Stearns is overwhelmed by the most-recent Osher Foundation gift. “This is unbelievable for this University,” he said. Ongoing private support — from both community members and from foundations like Osher — is crucial to MOLLI’s success. You can learn more at umt.edu/SupportMOLLI.